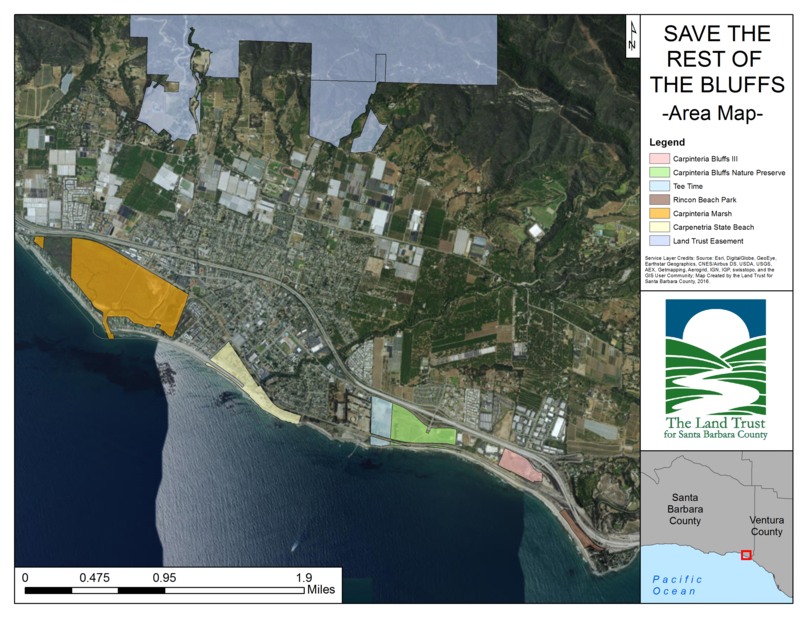 We can save one more stretch of open coastline in Carpinteria! Click here for press release distributed June 15, 2016. For more than 50 years, the residents of the South Coast have dreamed of preserving all 100 acres of open space that make up the Carpinteria Bluffs. In 1998, the community rallied to purchase nearly half of the Bluffs, raising more than $4.5 million in four months. The result is a park and preserve beloved by the entire County. With a little luck and a lot of grit, the Land Trust has created an opportunity to preserve an additional 21+ acres of the Carpinteria Bluffs! Carpinteria Bluffs III (the easternmost section overlooking Rincon) is one of the last remaining undeveloped coastal properties between the western edges of Goleta and the Ventura County line. The rest is virtually all developed. This iconic stretch of our coast—like More Mesa—is a property that we must act on. It’s a once-in-a-generation, urgent, opportunity for the Land Trust. We are excited about working with the community to make this dream come true. Let’s not lose this section of our beloved bluffs. Carpinteria Bluffs has been a treasured community resource for generations. For years the people of the South Coast have hiked, biked, painted and bird watched along the Bluffs. Nature enthusiasts seek out local flora and fauna and watch mother seals give birth from the cliffs and, below, Rincon Beach Park buzzes with activity. Birders and bikers, surfers and seals—the Bluffs and the coastline are the essence of Carpinteria and the South Coast, and the hub of an extraordinary confluence of special, natural places: Los Padres National Forest and the Santa Ynez Mountains, Channel Islands National Park and Marine Sanctuary, the Rincon. Be a Hero, Help Make History in your Community. After several months of intensive negotiations, the Land Trust and the Citizens for Carpinteria Bluffs are close to securing the property, but the land is not yet fully owned. A total campaign goal of $7.9 million allows for the purchase, initial restoration and ongoing stewardship of Carp Bluffs III. We have lead gifts for $3 million pledged toward the $7.9 million campaign goal and an additional $2.4 million in pledges raised during the quiet phase of the campaign. 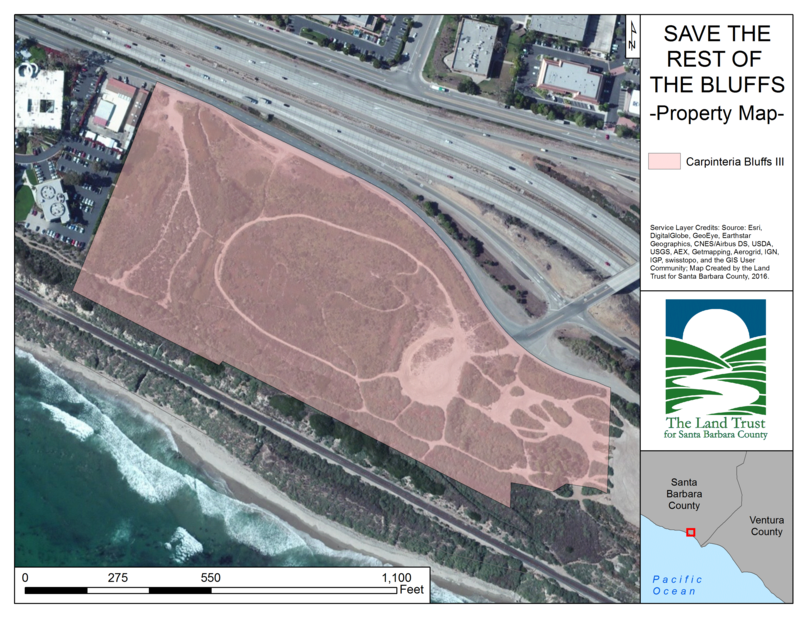 There is the potential for up to $1,000,000 through public grants and the Land Trust and Citizens for the Carpinteria Bluffs are now looking to the community and these grants for the remaining $2.5 million! This is the Campaign to Save the Rest of the Bluffs. 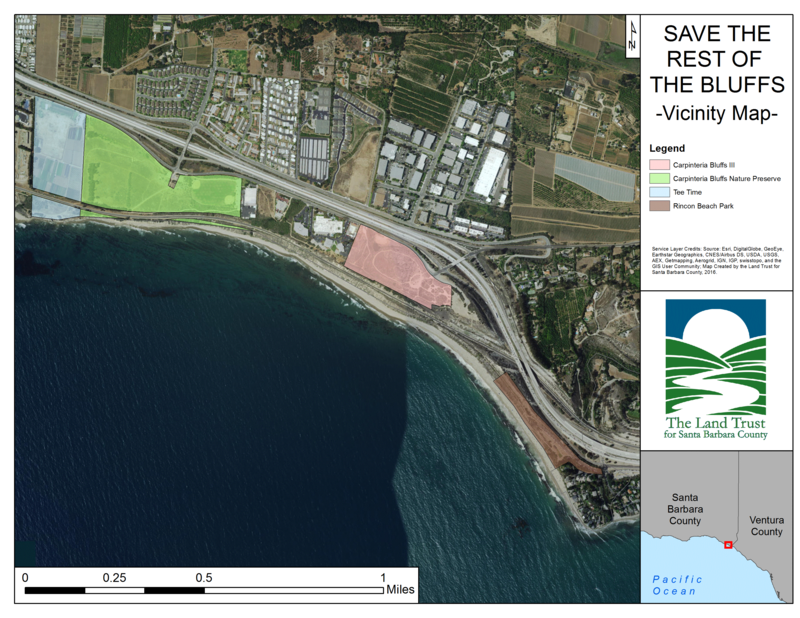 Invest in the future of Carpinteria and the Santa Barbara coastline. The Carpinteria Bluffs are a source of inspiration for past, present and future generations. Let’s Work Together to Save this Space Forever!